Earlier, man was not very particular about their clothes or how they look on their marriage. However, things have changed over the passage of time and now you can find that men give lot of importance to their dress. They look for the best collection so that look smart, handsome and elegant. In wedding, nothing is more confusing than buying wedding blazers for men. Getting the perfect suit for your marriage can be easier if you spend some time in making the selection. Fashion designers come up with the new design every time to match the latest trend as the fashion changes from time to time and people will look for the most recent collection. Marriage means you have lots of arrangements to make and the most essential task is to get the accurate and gorgeous blazer for the groom. Sometimes, people get confused about which one to buy. So, here are some tips given which will help to choose the correct blazer for your nuptial ceremony. The first thing that needs attention is the color of your blazer. You must choose a color which perfect matches with the bride. Make sure that it perfectly matches with your skin tone and your hair color as there are certain colors which do not match with every skin tone. Colors play a dominant role in enhancing one’s appearance. Therefore, it is necessary that you get the perfect color for your marriage ceremony. Multiple colors are available so you can make your purchase depending upon your personality. If your nuptial ceremony has any theme then you can buy your blazer depending on the wedding theme. Another factor that needs attention while buying wedding blazers for men is the comfort and perfect fitting. A well-fit and perfect cut blazer will make one look smart and elegant. You must get a suit that perfectly fits with your physique. If the cloth perfectly fits on you then you will feel relaxed and comfortable. Moreover, perfect fitting suit makes one look smart and nice. One more thing you need to look for is the fabric of your blazer. This clothing comes in multiple fabrics and preferred for different occasions. For example, if your marriage takes place in the summer season then it is best to look for the suit made out of cotton. Cotton provides great comfort the wearer even if it is too warm. You must pick a fabric that you are comfortable with. Another significant factor to be considered is the style and design of the blazer. Generally, blazers are available in two types–double breasted and single breasted blazers. You may choose the one that best suits your personality and your physique. 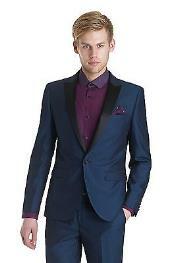 Getting perfect wedding blazers for men is not a difficult task if you follow the above mentioned tips. So, what are you waiting for? Get the right garment and look stunning on your nuptial ceremony.